SLC Community Choirs is a non-profit organization focused on providing quality music experiences and education to singers of all ages. Unlike other choirs, we are not affiliated with any one school or church but with the entire community. Our members include individuals from the Solanco, Lampeter-Strasburg, Oxford, Octorara and Penn Manor school districts. Crescendo offers singing opportunities to individuals in grade 9 through adult. The choir rehearses on a weekly basis and performs at least two concerts per year. Typical choir repertoire includes folk tunes, show tunes, spirituals, multicultural selections and contemporary choral pieces. 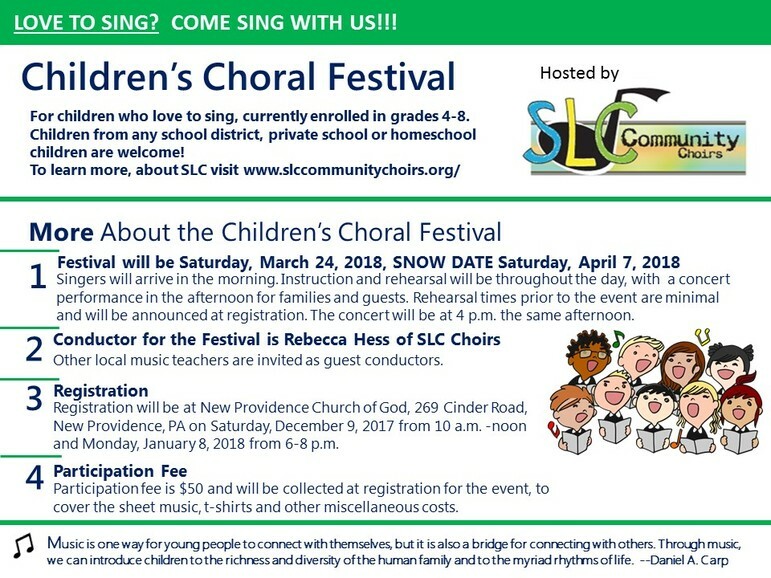 New this year, SLC Community Choirs is hosting a Children's Choral Festival on April 8th. All young singers in grades 4-8 are invited to register. See this site for more information and for a link to our registration paperwork. Click the image above for a PDF version to print out and give to your friends! This is our adult choir Crescendo.